I spent the morning at my favorite bookstore and purchased a few new additions for my bookshelf. It's always so peaceful to be in that shop. The owner/author Louise Erdrich is a member of the Turtle Mountains Chippewa tribe whose reservation is not far from my cabin in North Dakota. I like to read her books and see in my mind the towns and areas that she references. It's like seeing the same thing with very different eyes. This afternoon I sat at a cafe and wrote some letters to friends and now this evening I think I'll sit inside and knit. All in all I think it's going to be a perfect rainy birthday. After a few months of unemployment I got a job again, which is contributing factor #1 to the demise of this blog. This is now my view every day. Contributing factor #2 is that I was preparing for an audition, which means that when I wasn't staring at those computer screens, I was staring at a music stand... and not much else. I didn't win the audition, but I did travel to Colorado Springs for it. I honestly haven't been doing a whole lot worth reporting despite my lengthy absence. I did get away from the cities for a brief trip to northern Minnesota - Lutsen, to be precise, for a bluegrass festival. My best friend's husband plays mandolin and she begged me to come along and keep her company with promises of hiking and hot tubs. That there is part of the Superior Hiking Trail which, now that I know it exists, I would love to hike sometime. It's 275 miles long. That's a bit of a commitment. And that room there is actually where I slept. Not in the tub, but on the floor next to it. We stayed in a condo that we rented for the weekend (Lutsen is essentially a ski resort) and all the other rooms were occupied with other bluegrass players. I didn't know the lake was right there until I woke up in the morning thinking, "What is that incessant noise?" It was waves crashing on the rocks. I have no idea how something so massive managed to stay so well hidden when I arrived. As for knitting, I have a small collection of projects that aren't necessarily newly finished, just somewhat neglected. I finished a pair of socks a while ago in Malabrigo Sock and they really might be my favorite pair so far. I can't imagine they'll last for very long, though, the yarn being what it is. 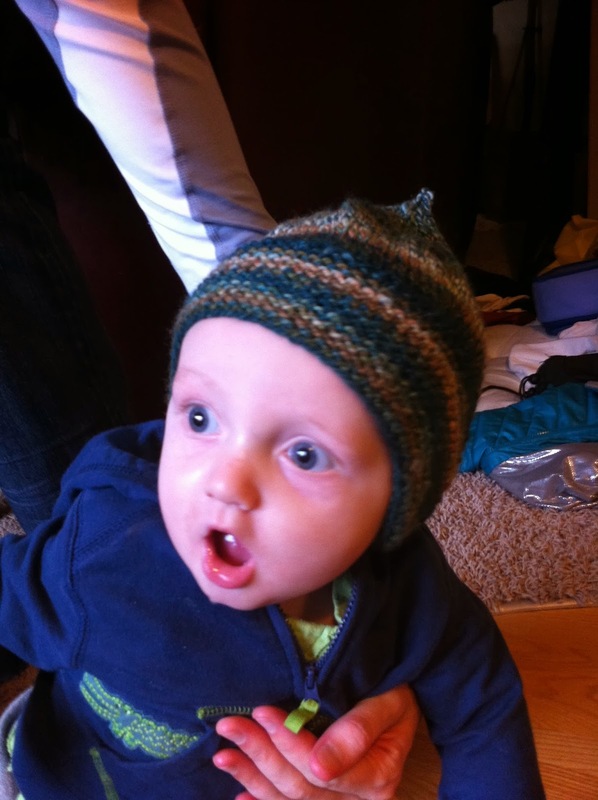 I also recently used some handspun to knit a hat for my niece/nephew. The intended recipient was rather generalized as it was contingent more on who it would fit than anything else. Yes, darling, that's a beautiful belly button. (iPhone photos and moving children. Whatcha gonna do.) 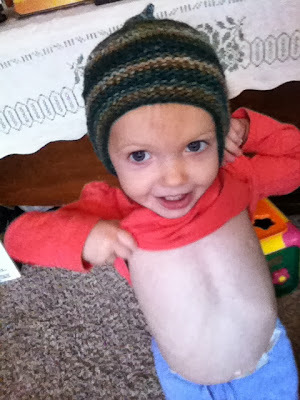 I decided the hat fits both of them, so I'm just going to knit a second one and call it a day. (It's actually almost finished.) 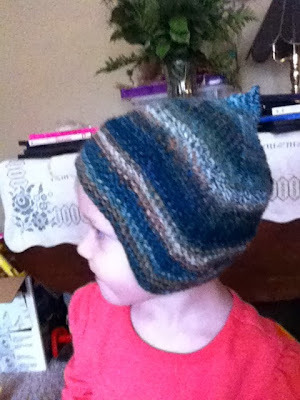 Oh, and before I forget, the pattern is Quynn by Woolly Wormhead. Adorable. And then just today I finally got around to taking photos of a hat I finished, oh... I don't know. Two months ago? That's the first thing I did this morning - enjoyed the silence of the woods by the Mississippi river. Cables and Lace Beret by Michele Wang in the recommended yarn, Road to China Light. Alright guys, I have a book and a warm cup of tea with my name on it, so I'll end here. Take care. Happy Birthday! So glad you're checking in once in a while to post a few words ;)! Happy birthday! And all the pretty woolies and the beautiful water and woods... xoxo I hope the years get better each time. Take care of you male knitter, you're so sweet. I'm 26 years in april... I feel like you. From where I sit (many, many years ahead of you in age) your journey has only begun and there is much to unfold before you. Family, nature, following your heart...they are the best things in life. You're living well. Happy Birthday! Happy Birthday Peter! I hope all is well - and the job is endurable and pays adequately. Happy belated birthday. Glad to see you posting again. Happy birthday, and stunning beret! Happy Birthday! Sounds like you know how to have a good one. I really must get my hands on some Road To China... over the last year I've fallen in love with The Fibre Co, and your beret convinces me of it all over again. Beautiful work. Happy Birthday, fellow Scorpio. My birthday was yesterday (20th). I too feel the need to reflect the past year and ponder what the new year will bring on my birth day. Having gone through 67 cycles another birthday celebration is frankly quite irrelevant. But looking at the past year,celebrating what I have accomplished and noting what I would like to finish is my present to myself. I wish you all the best for next year, many more spinning and knitting hours, joy in your music and perhaps even a job will come. it's a little too late but Happy Birthday! I feel exactly the same about it, it's not a big deal but it's very useful to think about what you have done in the last year and what you'd like to do in the next year to come. On another topic, I'm new to socks, i've only knit a big pair of "sleeping socks" because my feet are really cold at night but i can't stand socks, i always take them off while sleeping, so the pair i made are bigger than they should so that they won't bother me at all. I think i might knit another pair soon.. Happy (belated) Birthday from another fellow Scorpio! 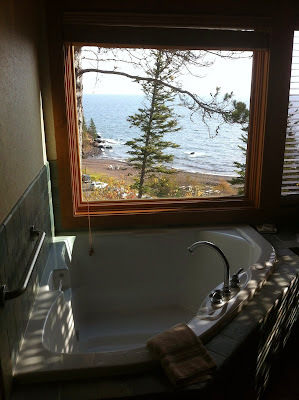 I spent a few days on the North Shore of Lake Superior a year ago -- including a visit to Lutsen -- and dream of going back. It was so beautiful! Happy (belated) birthday as well! Nice to see your projects and good to see you're blogging again. Thanks for sharing!